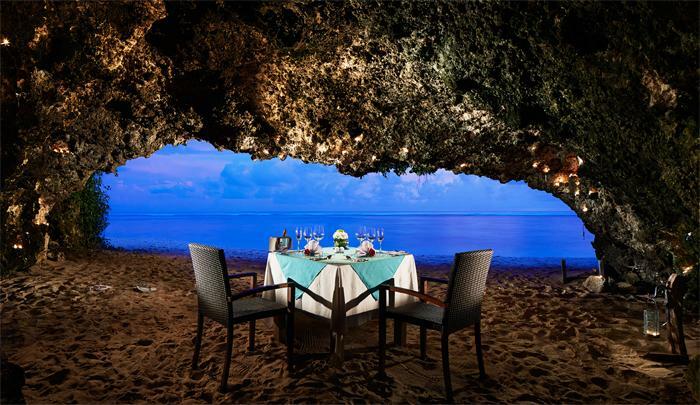 If you’re thinking of a special place for your romantic dining date, what could possibly be better than a secret cave at a secluded beach in Bali? Situated on top of a cliff in Nusa Dua, Samabe Bali Suites and Villas is the perfect hideaway to enjoy the meal with your loved one. Here, you’ll be served with the wonderful 5-course set menu while listening to the gentle sound of waves lapping the sand. After dinner, you would probably want to take a romantic stroll along the beach and feel the ocean breeze, or just laze around enjoying the luxurious aromatic bath by the candlelight. Isn't that the perfect date you’ve been waiting for? Given its location atop a hill on the southern coast of the island, Ulu Segara offers a gorgeous panoramic view of the Indian Ocean, promising an unforgettable getaway with absolute relaxation and a feast for the senses. This 5-star accommodation features earthy hued walls, glass windows and doors, natural wood and stone craftsmanship in its design blending perfectly with the tropical surroundings. On the premises are a private swimming pool, a gym, a library, as well as many luxurious amenities so that you can make the most of the holiday without having to leave the premises. When you’re hungry, come dine at Ulu Segara Restaurant & Bar, and admire the look out of the floor-to-ceiling glass windows at the blue ocean. Then, enjoy a do-nothing day just chilling in the pool and soaking up the sun with divine frothy cocktails at the swim-up bar – Cawan Pool. Or you can simply get a nice tan out at the sun deck by making full use of Solace Spa. So classy and divine a stay, don’t you think! Located in Nusa Penida, Angel’s Billabong is an epitome of stunning with a nature-made infinity swimming pool overlooking the Indian Ocean. The road to this beautiful sanctuary is quite challenging since you have to climb down a rugged, sharp coral reef. But once the pool’s crystal-clear water is within sight, you’ll see why all those bumpy roads are totally worth it. Arriving in the area, you’ll be presented with a sublime natural arch created by the rock cliffs going down into the sea. And then, the crystalline water and the marvelous emerald hues of the green floors. I'm sure that at that moment, you’d want nothing but to jump right into the ‘pool’. Now, all you need to do is just chilling out and taking in the beauty of the sea lying right beyond the edge of this beautiful lagoon. As the luxurious restaurant at the Viceroy Resort,CasCades overlooks a tranquil infinity pool and affords sweeping views of the lush tropical valley. CasCades’ flashy menu fusses a French base with Asian influences for an exquisite fine dining experience. If you wannatasteBali in a whole new way, try the 8-course Indonesian Degustation menu, featuring fastidiously crafted traditional dishes with a modern twist. Wanna soak in your private tub with an arresting view of the ocean? Come to Tegal Wangi Beach – a wonder of nature not to be missed. The little holes on the shore filled with seawater right from the ocean are where you can have a nice soak and a natural spa treat, with sand, all for free. Wouldn’t it be the perfect place for your romantic date? Just two of you, playing in the sand, basking in the sunshine and enjoy the ocean breeze. Not bad for a fun-and-money-saving date, right! Lovina Beach is not only famous for its splendid beauty with uniquely black sand and calm, turquoise water, but also for the fact of being the perfect spot for dolphin watching. The early morning before sunrise is the best time to see dolphins, and normally, you’d be taken out to the sea by a jukung (a Balinese traditional boat). Once there at the spot, you’ll get to watch dolphins leaping out of the water, twirling in the air, while at the same time, be enchanted with the arresting backdrop of sunrise on the ocean. It’s sure to be a memorable moment to spend with your significant other. Besides, scuba diving and snorkeling are also great choices for the two of you to admire the serene blue sea and stunning coral reefs of Lovina. Perched atop an outcrop amidst constantly crashing waves,Tanah Lot Temple offers magnificent views of the Indian Ocean, making it the idyllic spot to watch the sunset on the island. In the late afternoon, when the sun settles on the horizon,the temple is silhouetted against the vivid glow of the sky, turning the whole place into the glorious scenery. At that moment, everything around you suddenly becomes so tranquil, and beautiful,that you just want to freeze the time and enjoy it forever. Come, and you’ll see why Tanah Lot Temple is a not-to-miss destination on your trip to Bali. If you’re seeking a private place where the two of you can still enjoy the sunshine while watching the waves breaking on the shore, come to Nyang Nyang – one of the best off-the-beaten-track destinations in Bali. Due to some difficulties travelers might face in order to get there, including a rough, rocky dirt trail and 500-plus cliff-side steps, the beach barely has any visitors. But, don’t worry coz once you get there, it’s totally worth it! Nyang Nyang features golden sand and pristine water, lined by a towering green cliff. And don’t be surprised if you two are the only people on the beach. Where else to find a better place for some solitude than on this secluded beach in Southern Bali! Bias Tugal, or Pantai Kecil, is another stunning hidden beach for you to discover. Located near the port of Padangbai to the east of Bali, Bias Tugal is not much frequented by visitors due to the 500-meter rocky path you must get through by foot to reach it. But once you get the sight of pure white sand and clear water at the bottom of the hill, the whole mini-trek is just none of a problem! Here, you can enjoy sunbathing, snorkeling, and sea diving, or explore the beautiful coral reefs. Or just laze around and enjoy the arresting view! Can't wait to try them all with your loved one, hah!